By now, anyone who has passed through a Canadian elementary school is familiar with Aesop and his fables. We know by now that slow and steady wins the race (Tortoise and the Hare) that warmth is stronger than force (The Sun and the North Wind) and that sometimes even those who seem weaker than you can prove helpful in a sticky situation (The Lion and the Mouse). What we don’t know, or may have forgotten, is the magic and opportunity for learning that comes with seeing children engage with these tried and true morals for the first time. It was this spark of brand new engagement that I was able to experience on Saturday, when I attended Carousel Theatre for Young People’s opening of their production of Aesop’s Fables, scripted by Mike Kenny. Joining me at the Waterfront Theatre once again was a friend and former mentor of mine, and her five-year-old daughter, my Little Guest (LG). Those of you who have read my post inspired by watching Carousel Theatre’s The Wizard of Oz may remember that my LG got a little scared being close to the stage and did need to spend a short time in the lobby while the Witch was onstage. Jessie van Rijn, General Manager of Carousel Theatre, certainly did remember as she confirmed with us at the box office that our tickets this time were farther back and also right on the aisle, for the possibility of a quick exit. I’m grateful to Jessie for providing us with these seats but also delighted to report that LG remained happily in the house through the entire performance and has given her approval for seeing more theatre in the future. 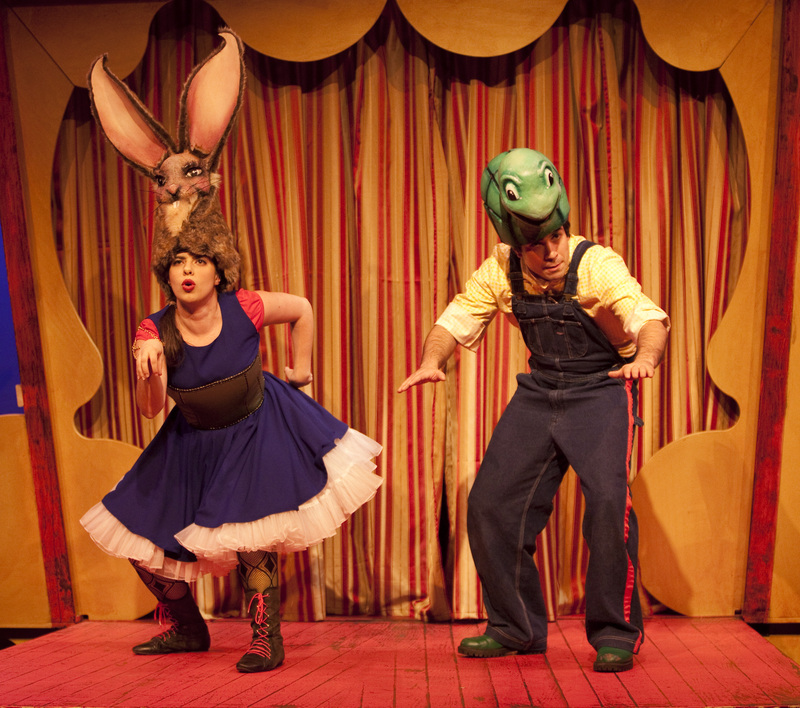 Carousel’s production of Aesop’s Fables is certainly for kids. 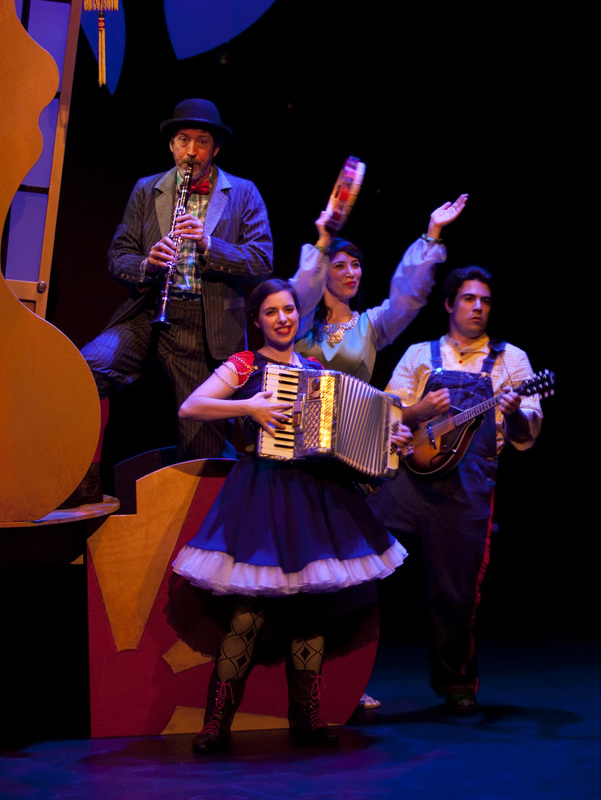 The humour, music, and “audience participation” moments are directed towards them. Judging by the reactions of the children in the audience, these moments were received with great enthusiasm by the young (and young at heart) who were happy to puff up their cheeks, fluff up their feathers, make silly sounds, and helpfully point out where sneaky animals like wolves and mice may be hiding. I should also point out that the house was almost consistently filled with laughter, which is always a good sign that kids are enjoying themselves. Though many of the moments in the production are not geared towards the adult members of the audience, there is much for us to appreciate: great music (much of it played live by members of the cast), strong (and often funny) physical performances by cast members, and (my personal favourite), an absolutely enchanting set designed by Drew Facey. Facey’s set is simple, but somehow elaborate at the same time, and when coupled with Darren Boquist’s elegant but not intrusive lighting, Aesop’s Fables is full of visual whimsy. After the show, the actors returned to the stage to take questions from the children in the audience. Every question was answered, whether it be a question about how an effect works, where the sound comes from, who made what, how long the actors rehearsed, or even a request to explain the fables themselves. I think this chance to have questions answered is a vital part of the show, removing it from a magical, untouchable “onstage” world and introducing children to the ways in which stories are told, problems are solved, and things are made. …while children shun moralizing they are drawn to morality. The drama of the fable, the animal characters, and the quick flash of its single illustration of a truth–these hold the attention of children. Fables are like small, bright pebbles picked up from the shore, stored in the pocket as reminders of past experience, and held in the mind when needed. I remember my own introduction to fables very clearly. We had a small picture book of them at home, and although I can’t remember every fable that was in the book, I remember the colours in the illustrations, the image of a thirsty crow drinking the water he earned through his cleverness, and the voice of my dad explaining the stories to us and what the morals meant. Fables are as familiar to us as fairy tales, and oftentimes, a lot more useful. The experience of being introduced to them for the first time can be a very rich memory later on. 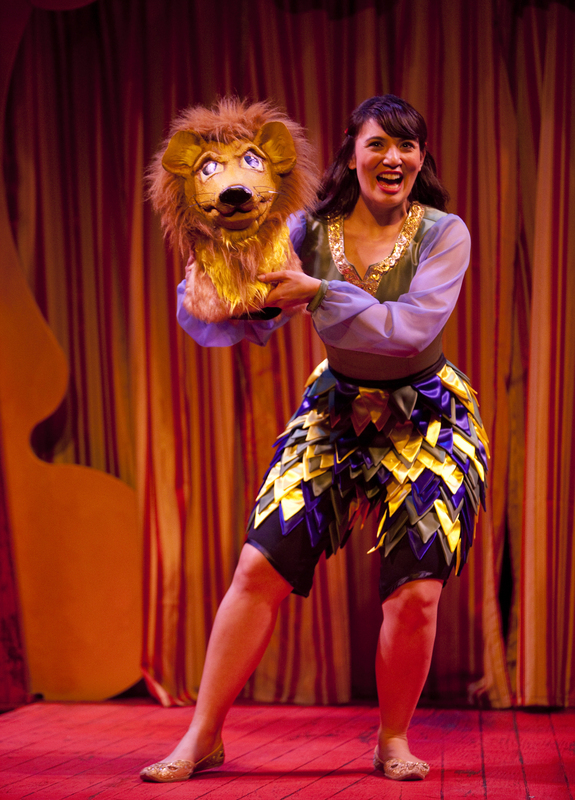 Aesop’s Fables runs at the Waterfront Theatre until February 26. For the times of public performances, please see Carousel’s Public Calendar on their website. Tickets can be purchased online on Carousel’s Box Office page or by calling 604-685-6217. Carousel’s season this year is based on literary classics, so if you’re interested, I believe the next production is A Year With Frog and Toad. My ticket, as well as the tickets of my guests, were provided for me by Carousel Theatre. I was not asked to write a review for this performance, and I remain solely responsible for my content, regarding this production or any other.